AB FORCE Glide your way to great abs with the revolutionary abdominal definer, the Ab Force! Glide your way to great abs with the revolutionary abdominal definer, the Ab Force! Stay in shape quickly using modern technology. The Ab Force 'Total Upper Body Solution', works more muscle groups and is more challenging. 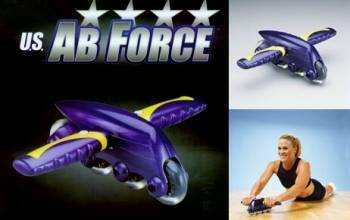 Ab Force concentrates your movement, while working your lower and upper abdominal muscles, obliques, arms, and back!